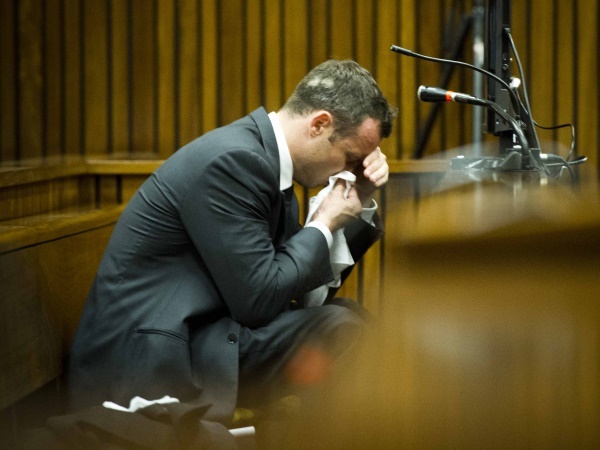 Week one of Oscar trial ends on highly emotional note Oscar Pistorius cried so much on the phone that he couldn't speak. This is what Pieter Baba, a security guard at Silver Woods estate, where Oscar shot Reeva Steenkamp, testified today. Oscar became emotional as Pieter spoke about the 14 February last year. He'd received several calls from residents, the guard told the court. Pieter had started to patrol the street in which Oscar lived an hour before the shooting and everything "was normal". He called his colleague, who was patrolling elsewhere with a bakkie, to pick him up so they could investigate because he didn't know where the shooting had originated. He initially went to Dr Johan Stipp's home, who then sent him to Oscar's house. "I called Mr Pistorius and he said everything is fine. The phone died. I heard he was crying and knew everything wasn't fine," Pieter said. "Mr Pistorius called me back and cried so hard that he couldn't speak." He went to Oscar's house and saw Oscar carrying Reeva down the stairs. "I was so shocked I didn't know what to do or check what clothes Mr Pistorius was wearing." Oscar's laywer, Barry Roux, suggested to Pieter Oscar had said he is fine but Pieter insisted the Paralympian had said "we are fine". The case was postponed to Monday when Pieter became too emotional to continue testifying.